The Carefree Way: The Carefree Way? So, some people may wonder where the title of my blog comes from. 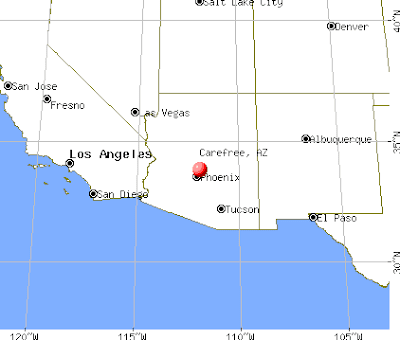 It actually all started in Carefree, AZ. Carefree, AZ??? Yeah. My aunt Robbie, myself, and my friend Mike all decided to go to a John Lyons horse training seminar in Carefree, AZ. We flew in and out of Phoenix, and actually spent a few days there visiting with Mike's sister. Mike had this bad habit of any time things weren't going his way he's say "I'm in hell." It was usually accompanied by a very exasperated look on his face. It was also all too common when he was on a road trip with me. Hmm. Anyway, we made a colossal mistake on that trip and didn't get a hotel reservation for our time in Carefree. We simply drove out there looking for a place to stay only to find that wasn't so easy. We drove all over the town looking for something, which included passing a lot of "Welcome to Carefree" signs. Mike happened upon one of his patented "I'm in hell" moments right as we passed another of those signs, so I responded with "no, you're in Carefree!" We were getting fairly silly from our long search for a hotel room, so it sort of stuck. Later he kept saying "I'm in Carefree" as we drove around, but we knew what he really meant. We finally found a place and had a really nice weekend, even if I was distracted from the seminar quite often checking UNC basketball scores. This was back when UNC didn't have a great team under Guthridge, but still somehow made the Final Four. We returned from our trip and only a few days later were meeting to try to come up with a name for our new horse business we were forming. The discussions and brainstorming wasn't going well and at one point I exasperatingly threw out "how about Carefree Ranch." I was joking when I said it, because at the time "Carefree" was really a euphemism for "hell", but after thinking about it I re-proposed it seriously. And it stuck. We now have Carefree Ranch. Several years later, we decided to get a street name for our driveway to help with 911 service (there are several residences on our driveway, so it makes it easier for emergency folks to find you if you give that a street name and each residence a street number). So we needed a street name. I pretty quickly settled on "Carefree Way" as our street name. And not much later my blog. No, none of this is anywhere near "hell"...far from it. But I do find it funny and somewhat ironic that such a big part of our lives was born that way.